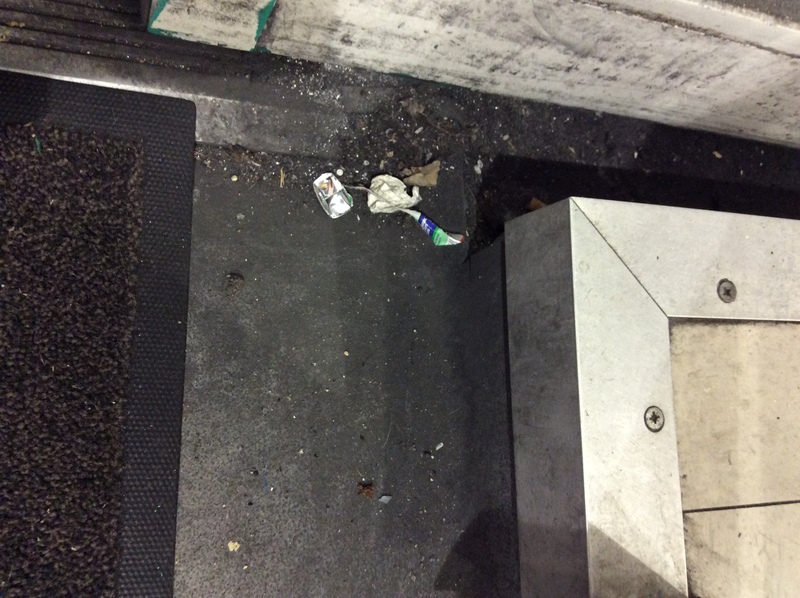 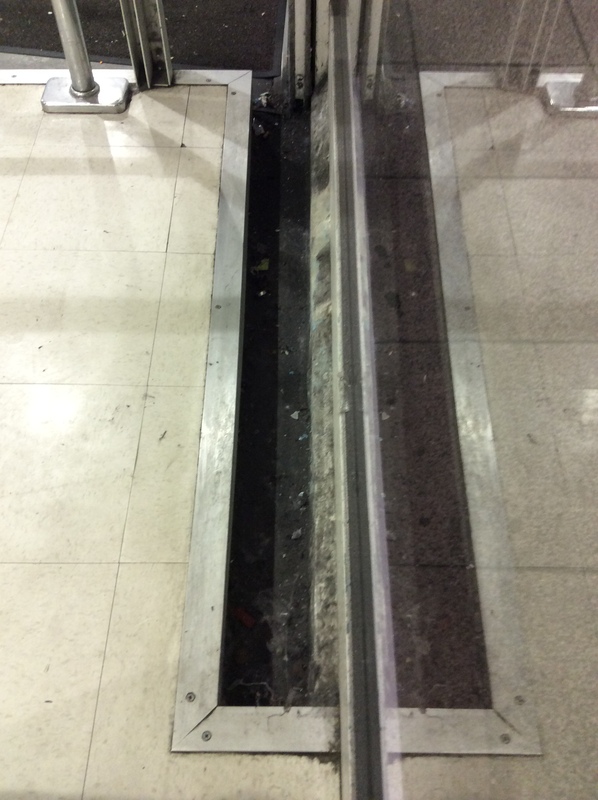 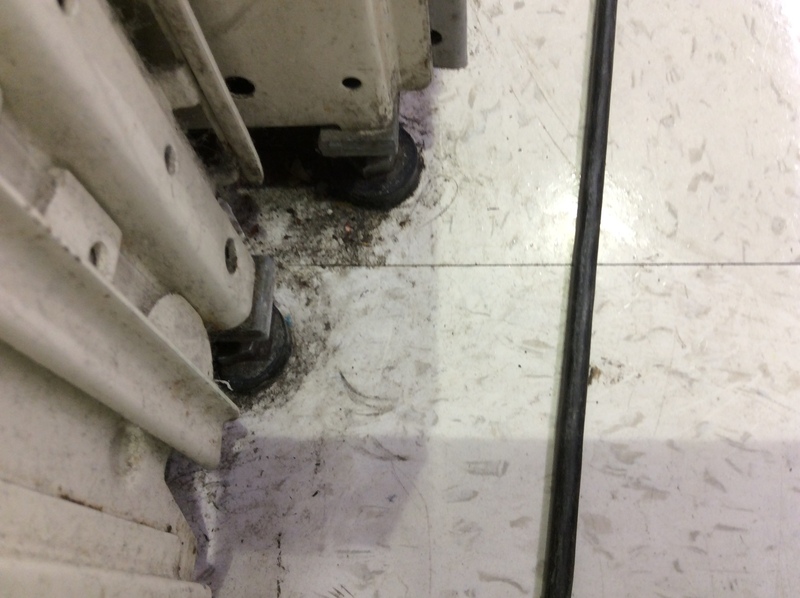 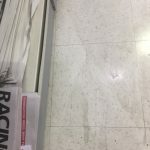 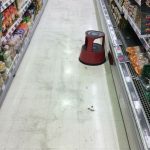 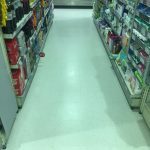 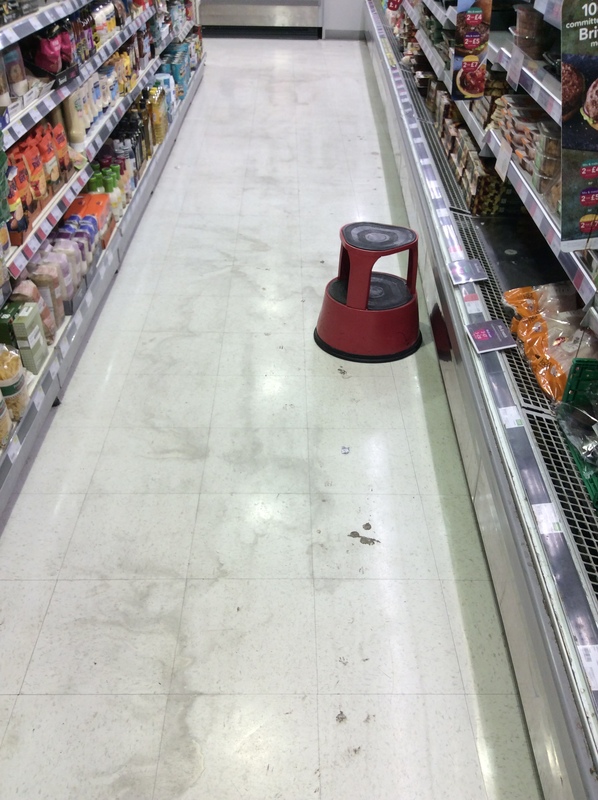 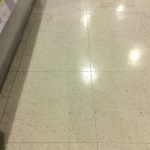 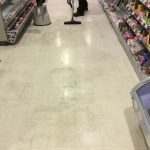 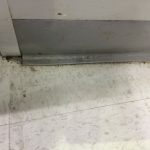 Another company had supposedly cleaned & restored this retailers floor. 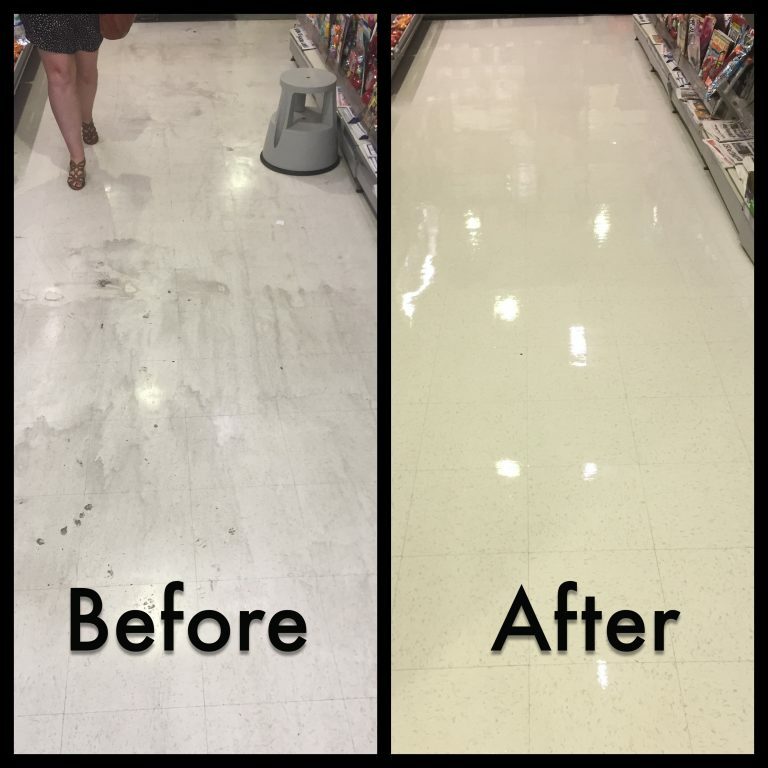 The store manager then called us in to properly do the cleaning and restoration to the standards they originally expected! 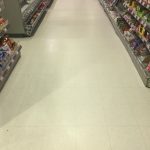 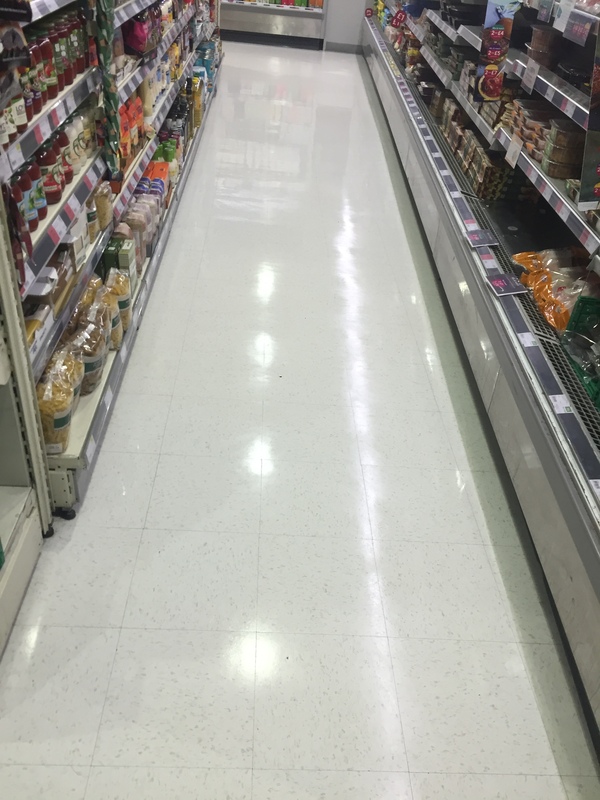 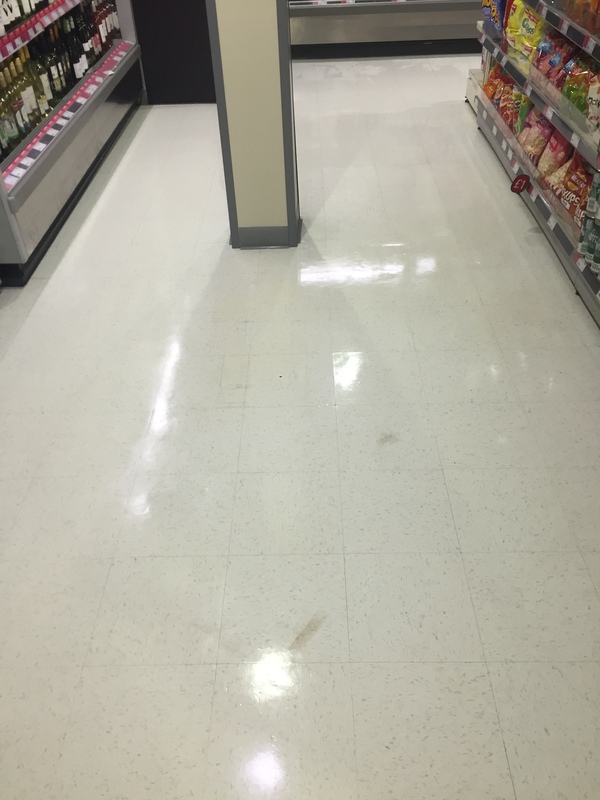 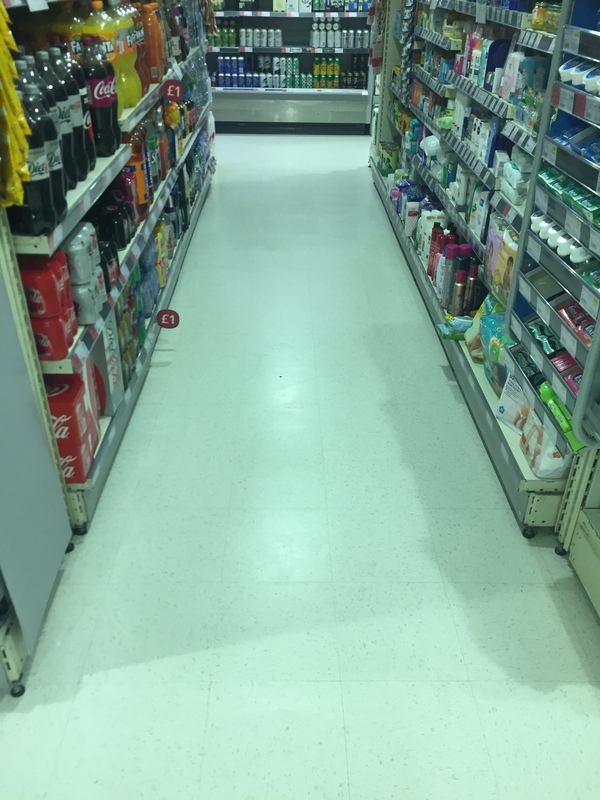 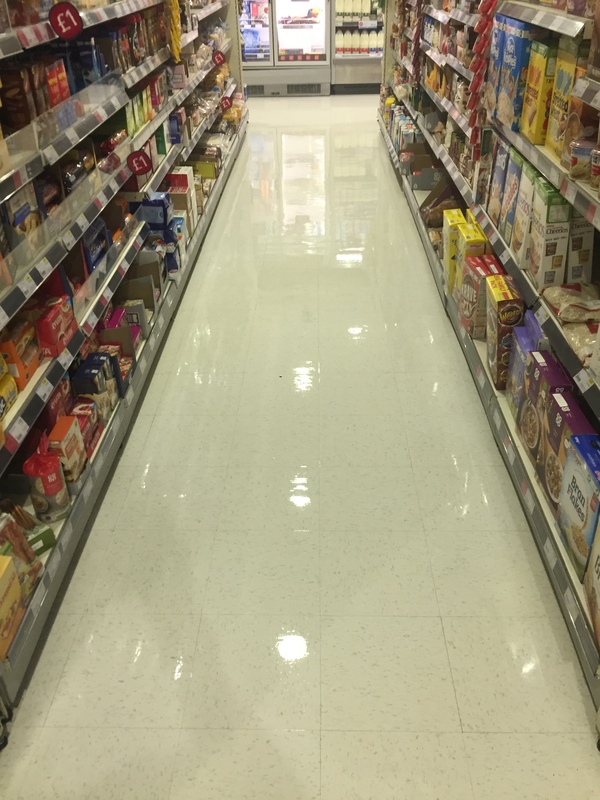 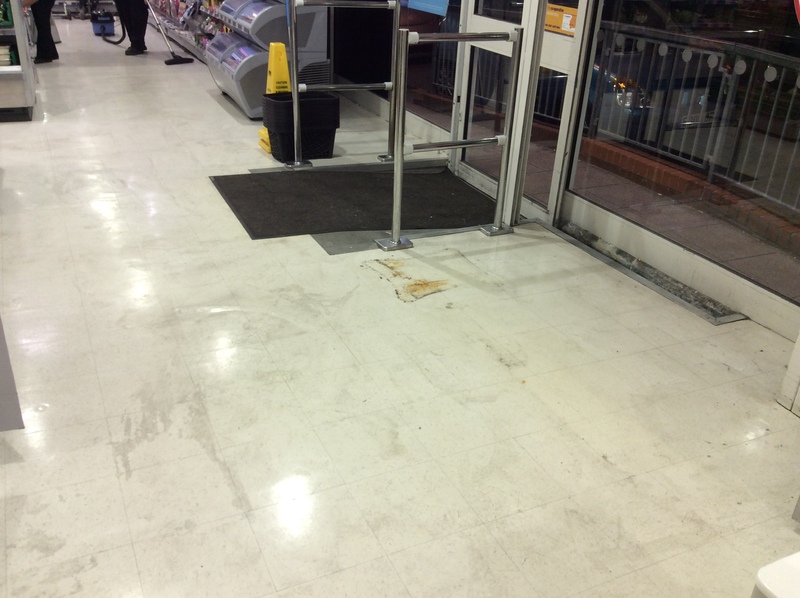 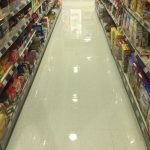 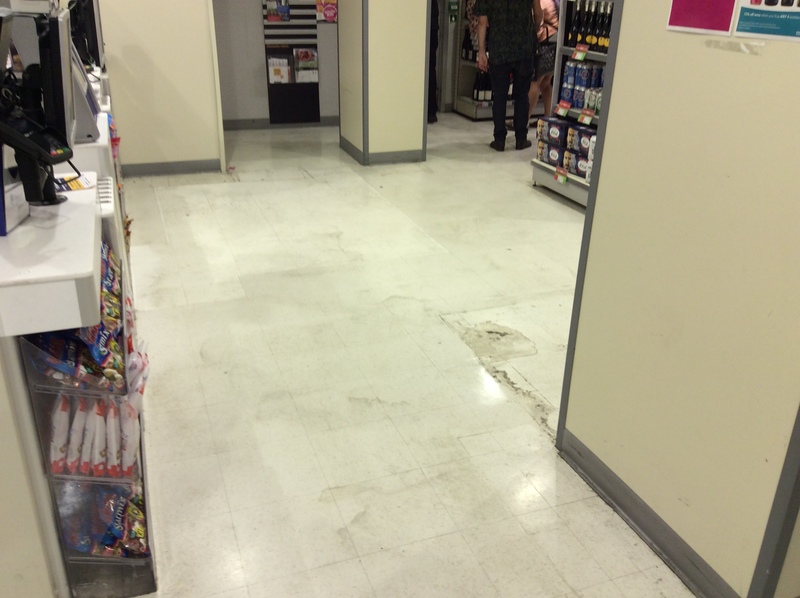 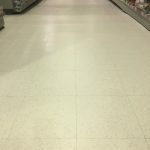 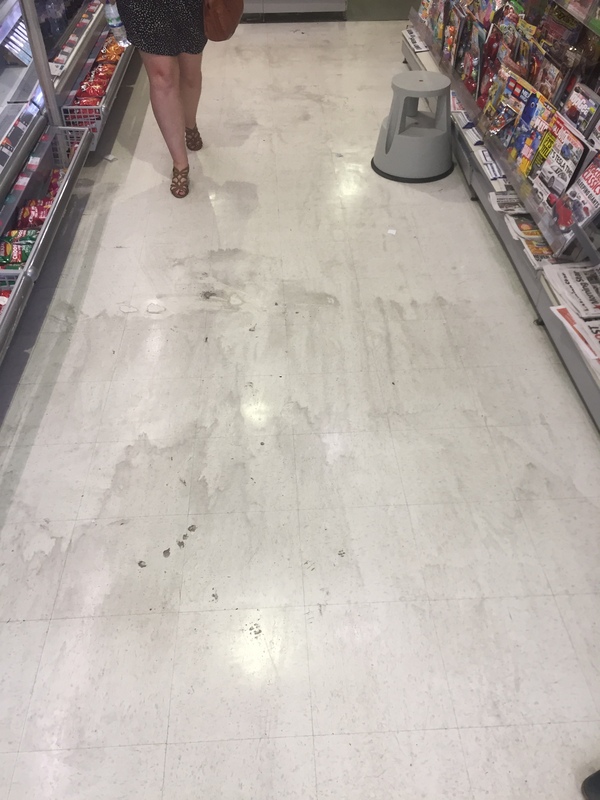 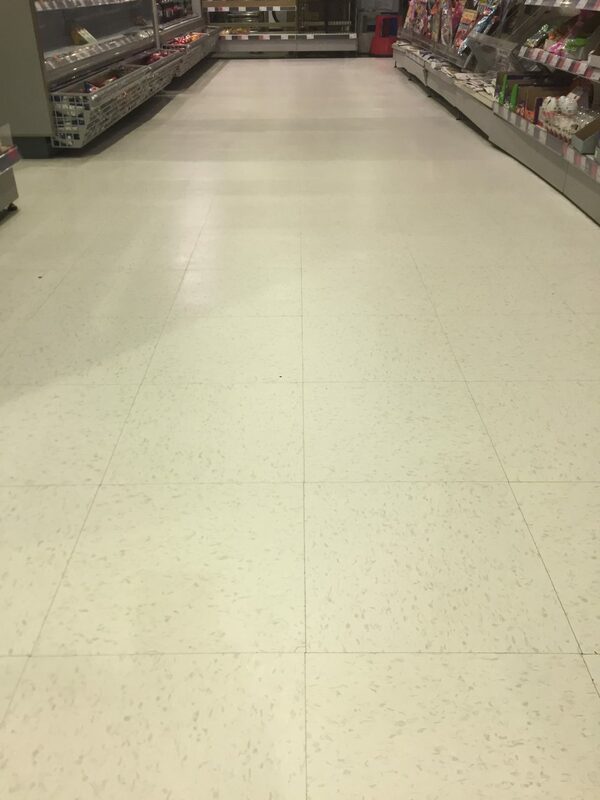 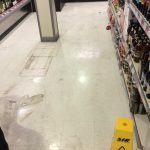 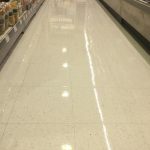 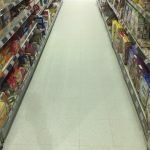 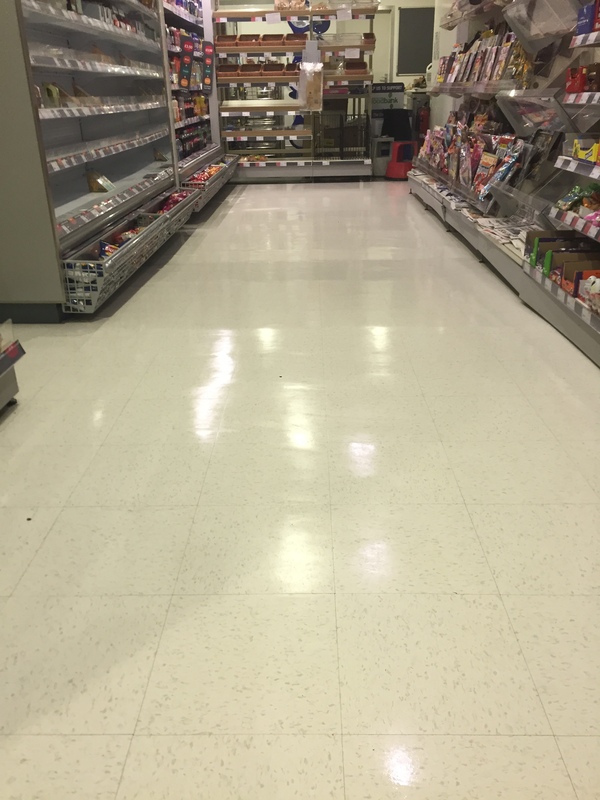 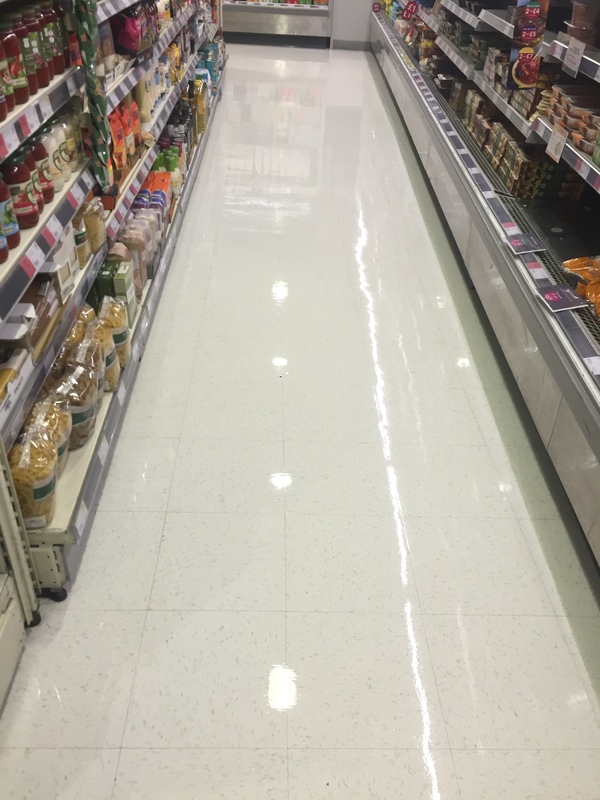 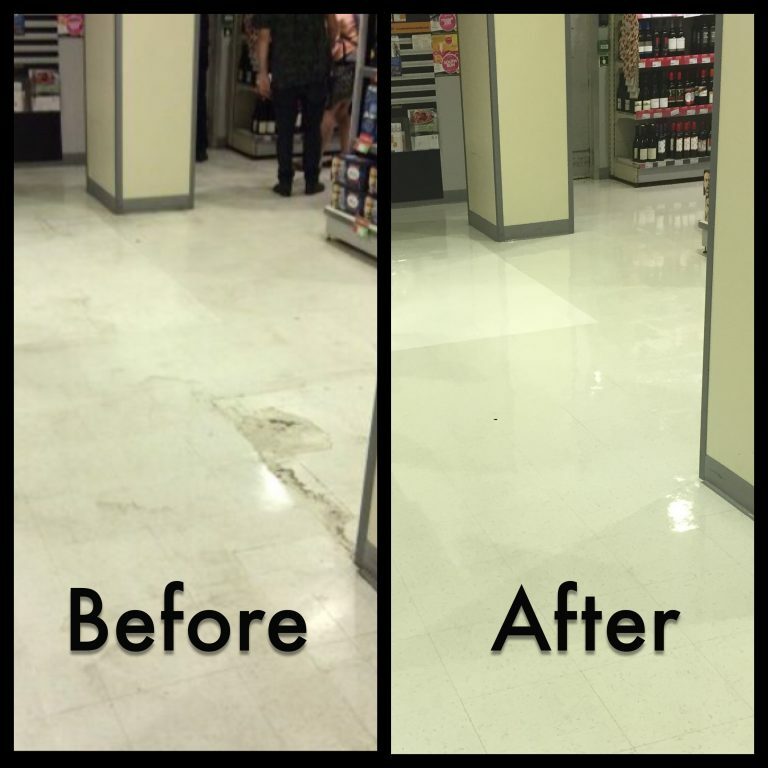 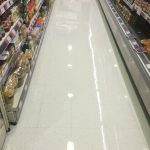 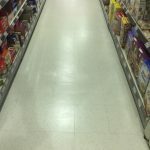 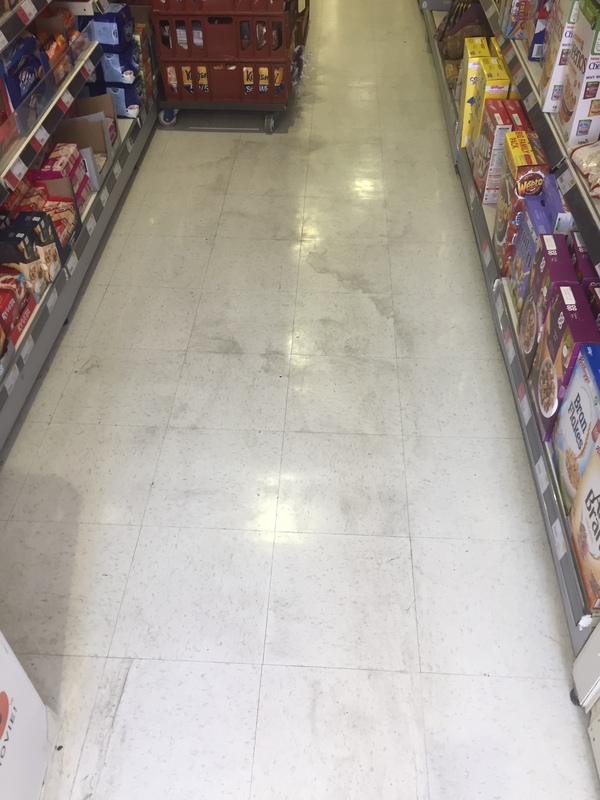 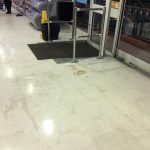 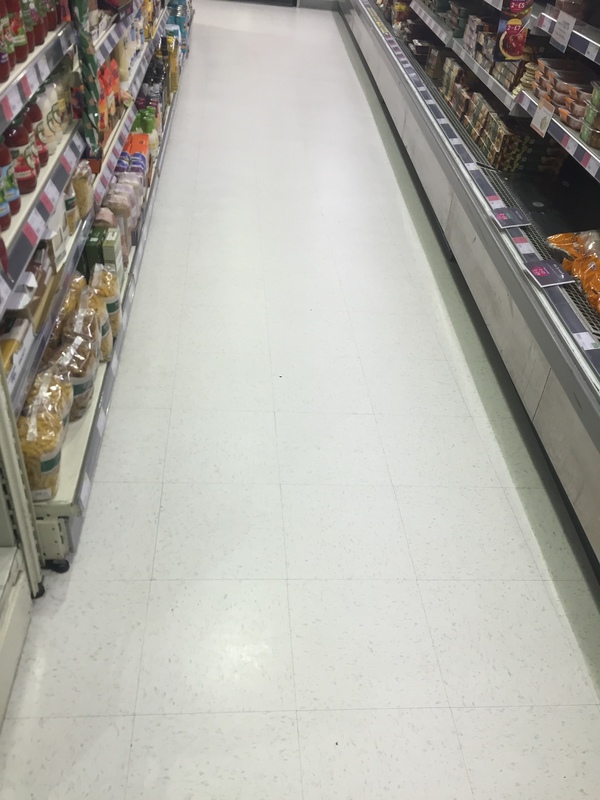 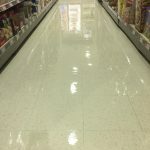 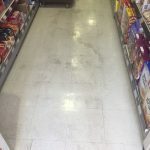 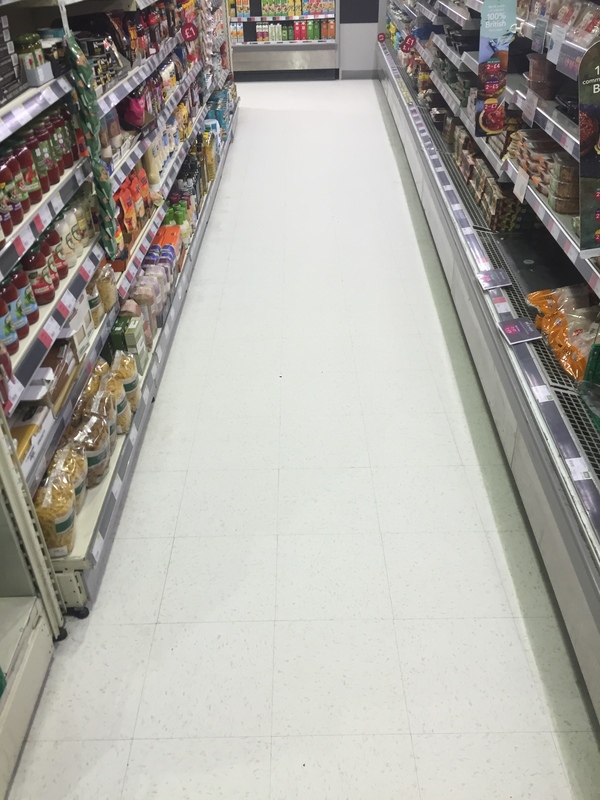 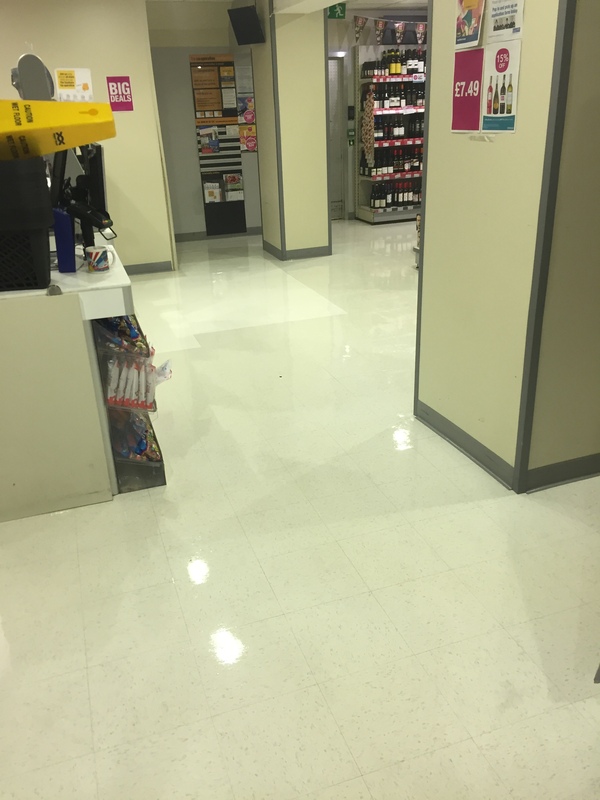 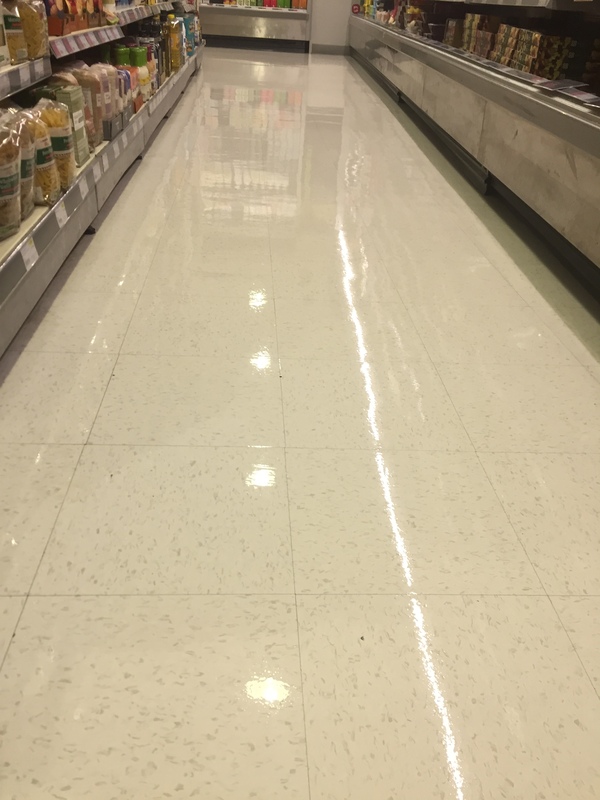 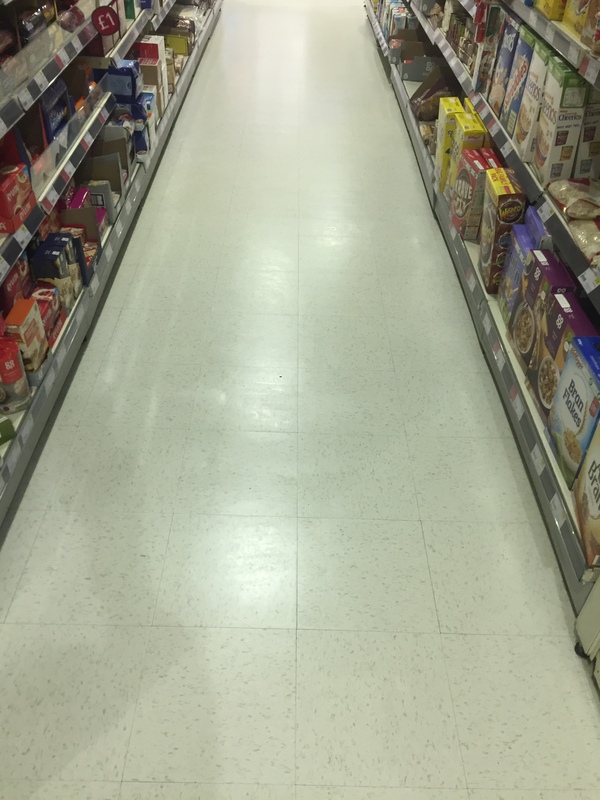 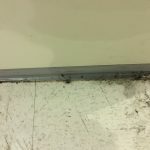 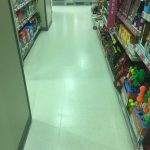 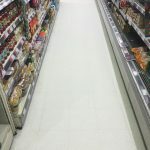 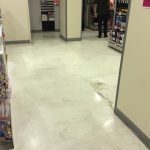 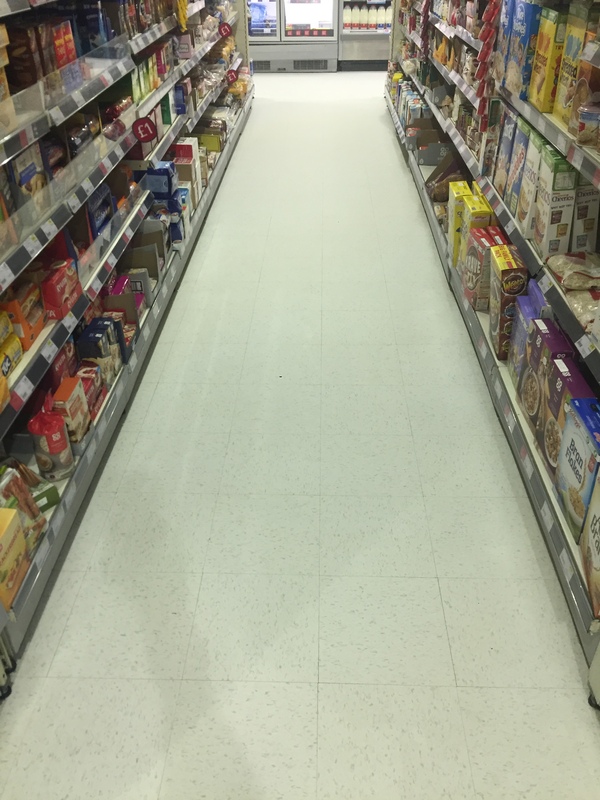 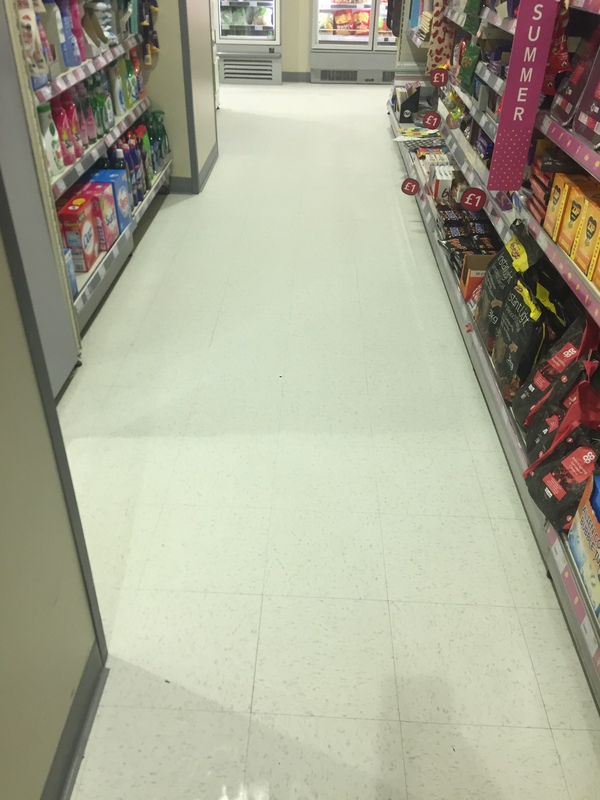 This major local retailer had their head office sent cleaning contractor, come in to do the major cleaning and restoration of their tile flooring. 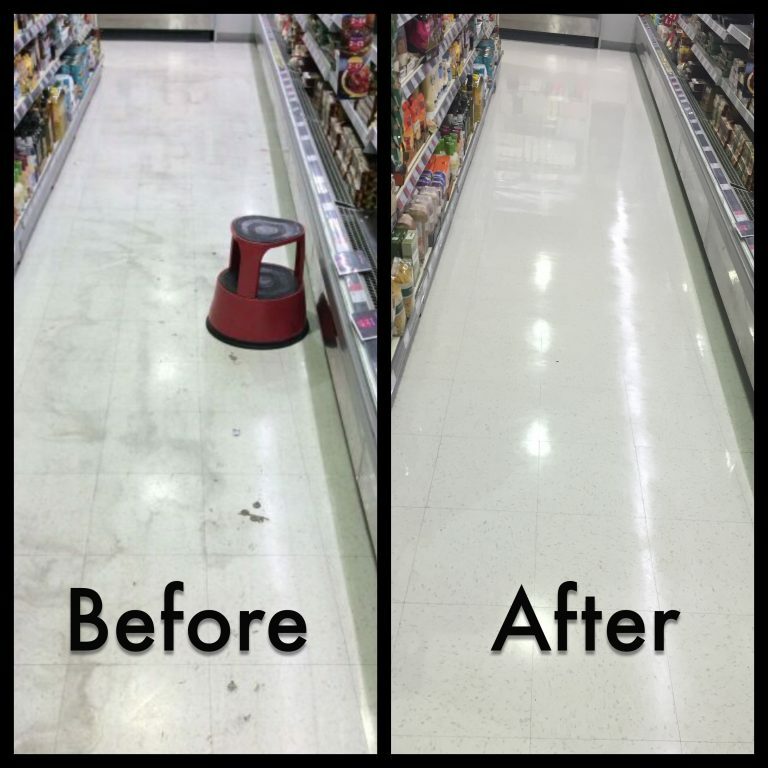 To say the standard of the finished job wasn’t what they expected was an understatement! 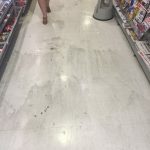 You didn’t need to be a cleaning professional to see that the flooring wasn’t clean and that something was very wrong with the finish. 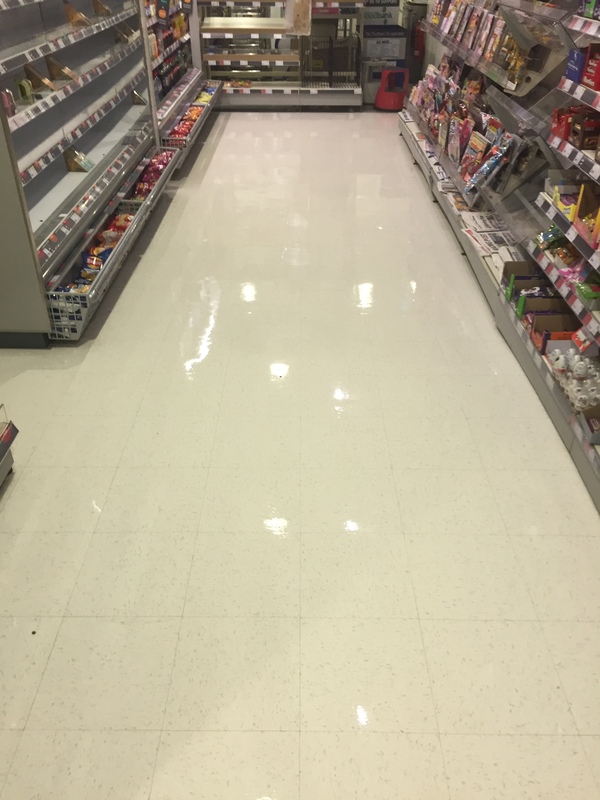 The client had specified a full deep clean of the flooring, coupled with a preventative and protective re-sealing, with a matt finish. 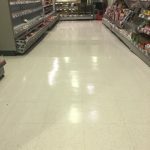 Take a look for yourselves at the other companies “finished” work. 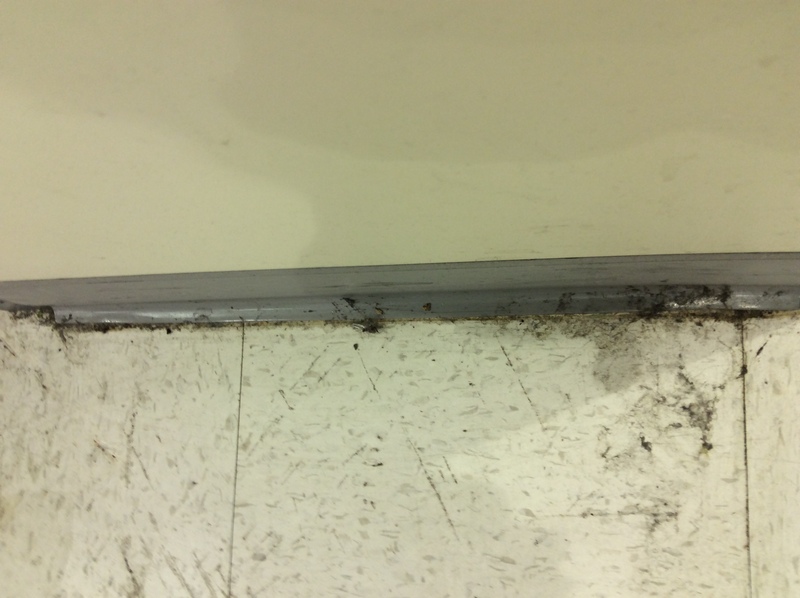 Failure to properly strip back the old sealant fully. 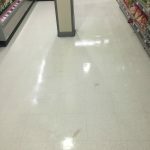 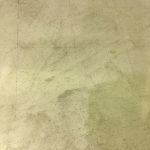 This has meant when the new sealant has been applied that there has been a chemical reaction with the remains of the old sealant and cleaning product used on it. 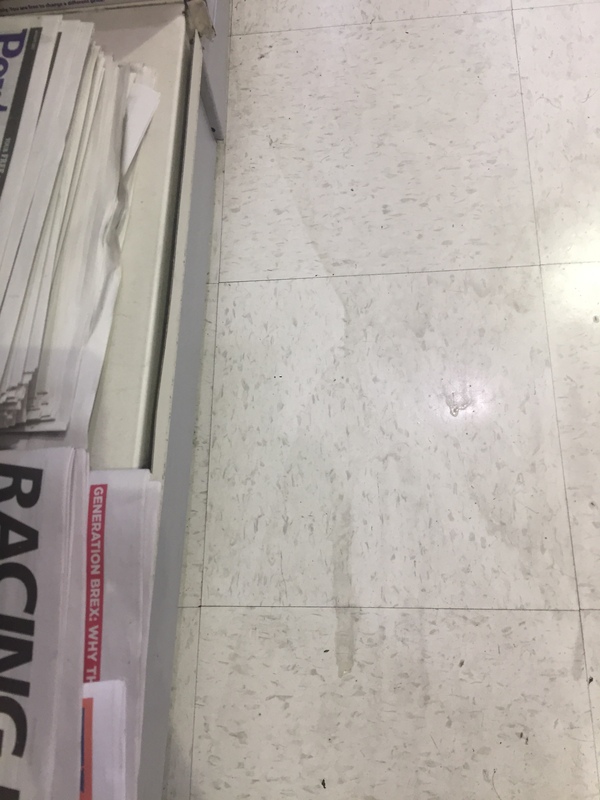 This has caused patches of dis-colouration. 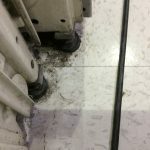 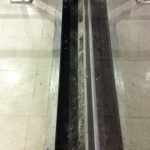 Failure to clean to and under shelf edging. 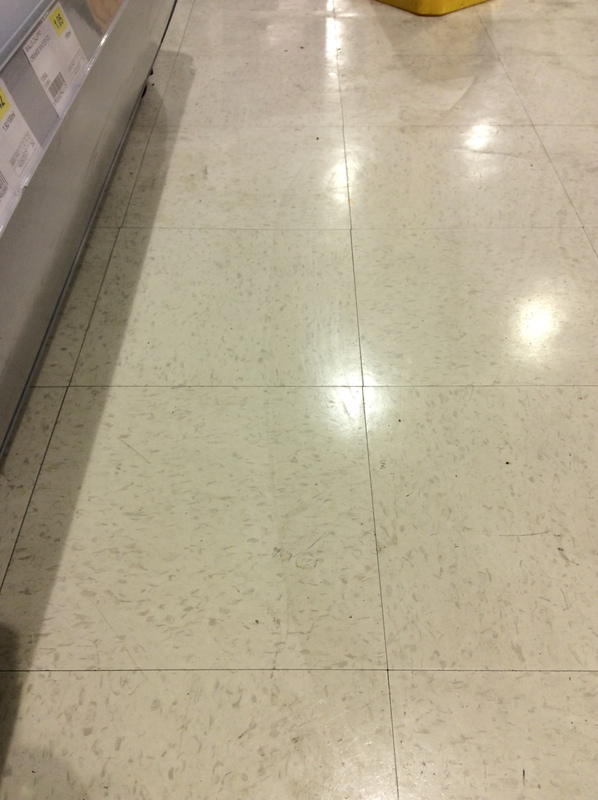 This has led to clearly visibile cleaning lines around and close to edges. 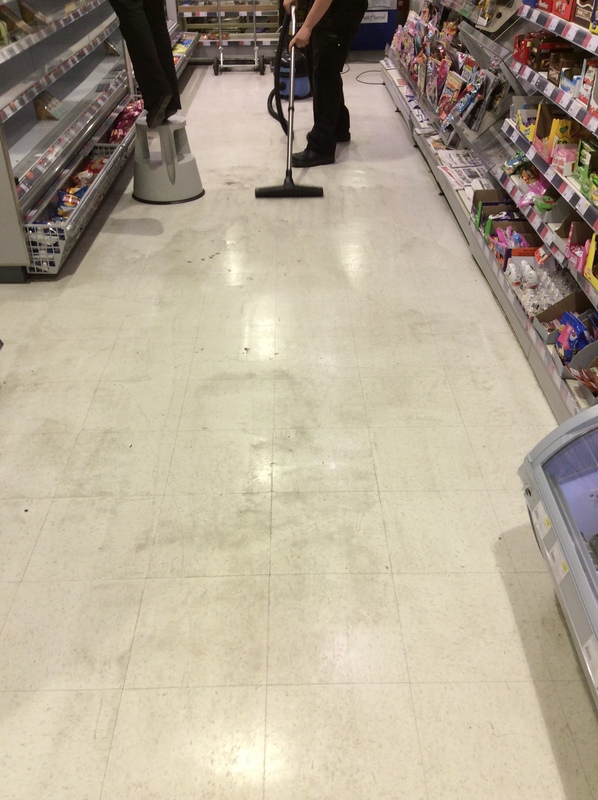 With shelving it is sometimes possible to move units back to allow seamless cleaning. 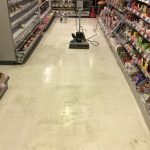 Where it isn’t is is important to take the time to clean right up to the edge, and ensure straight lines are produced right up to the units/walls. 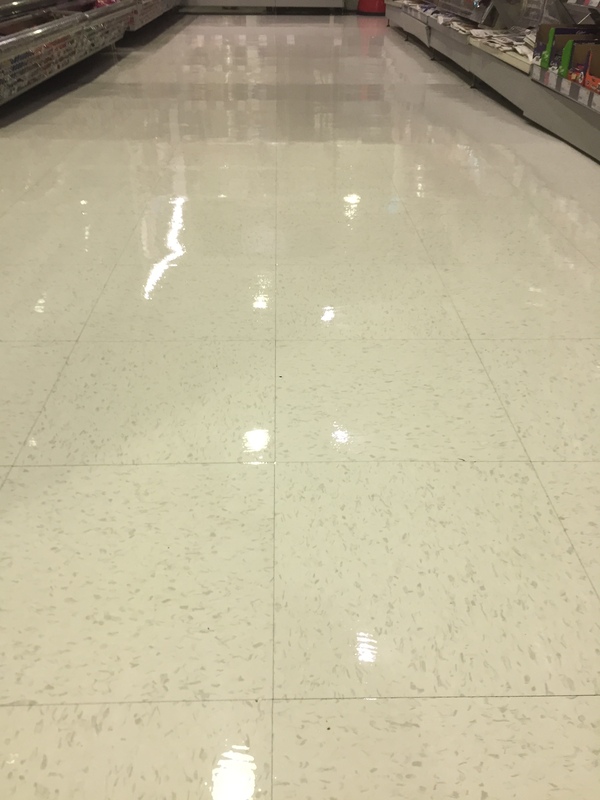 Incorrect sealing product for the type of tile. 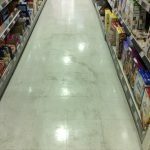 Every floor tile has a specific specification when it comes to how to clean, seal and protect. 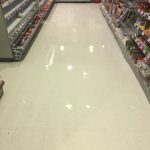 Understanding exactly what floor you are working on allows you to choose a product that will do the job. 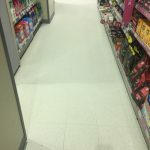 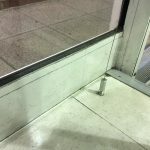 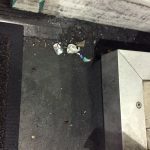 The store manager had worked with us before and when he saw the job that had been done, he insisted that his head office got T&H Contract Services in to correct the clean. 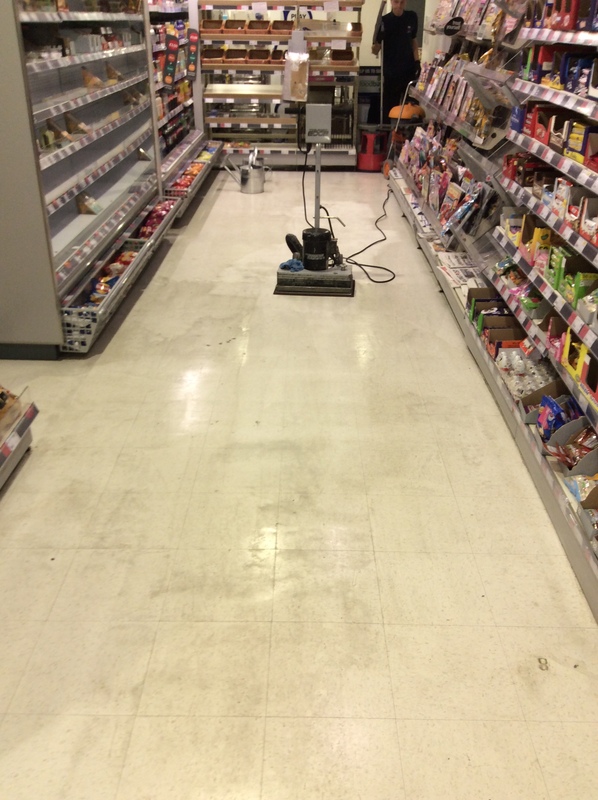 Once we had surveyed and understood the extent of the issues we set about rectifying the job. 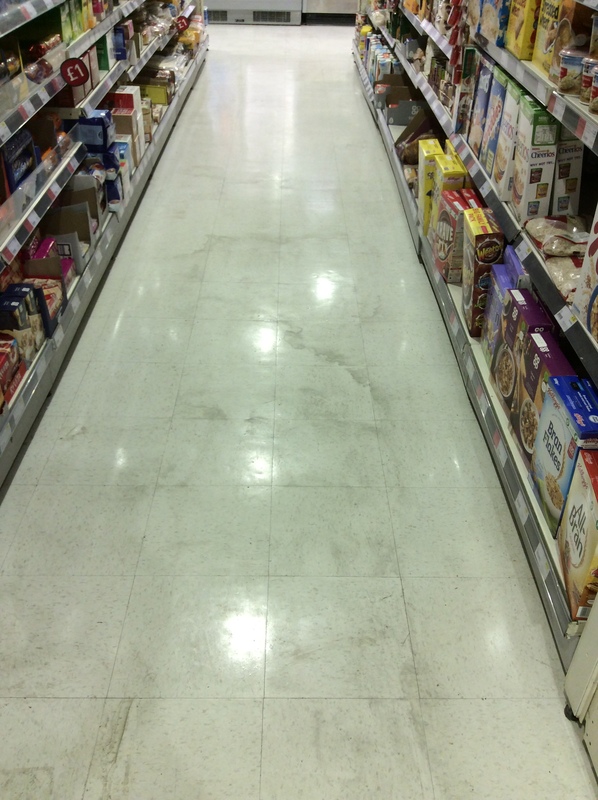 The first step was to completely strip away the recently applied sealant and to fully strip clean the floor tiles. 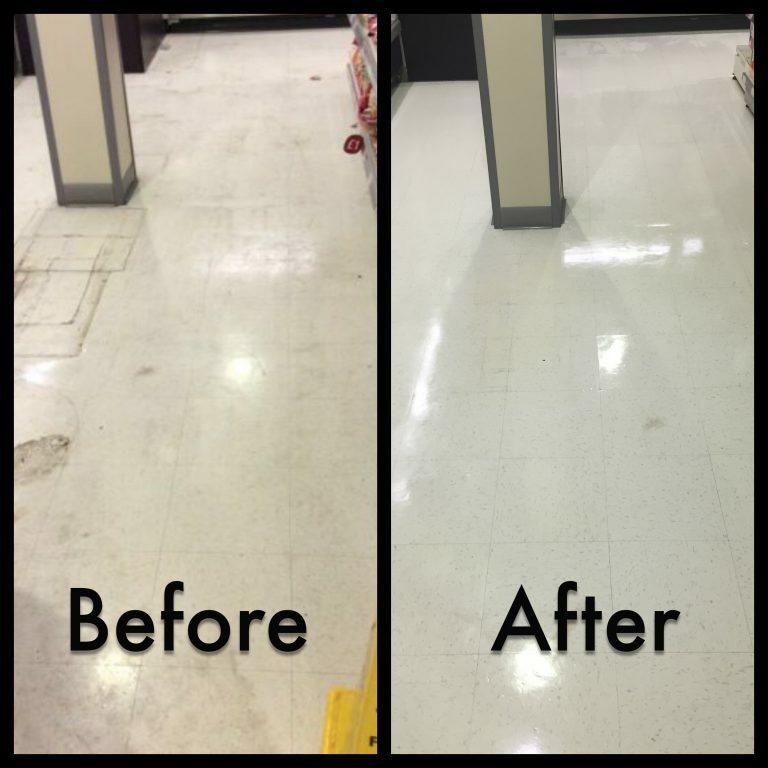 We actually double stripped this flooring due to the use of the wrong sealant and an insufficient job of stripping prior to applying this. 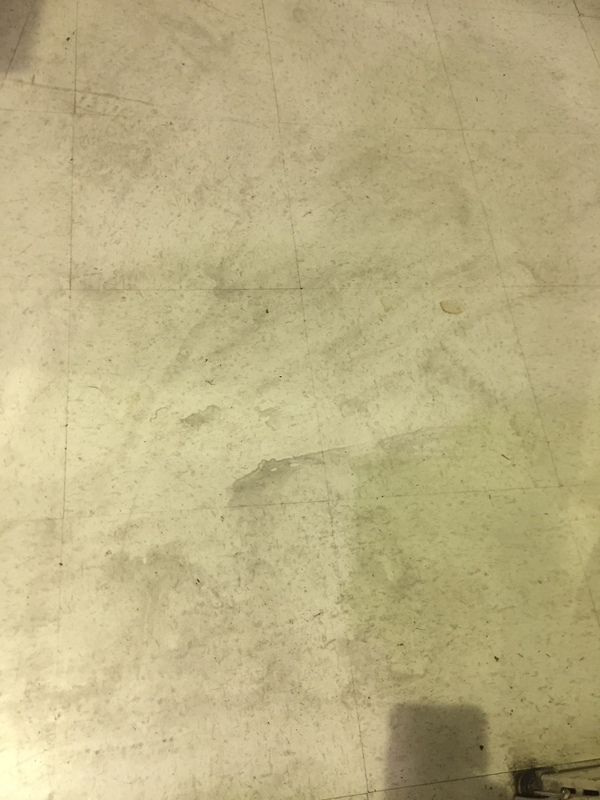 This left us with a clean floor surface to work with. 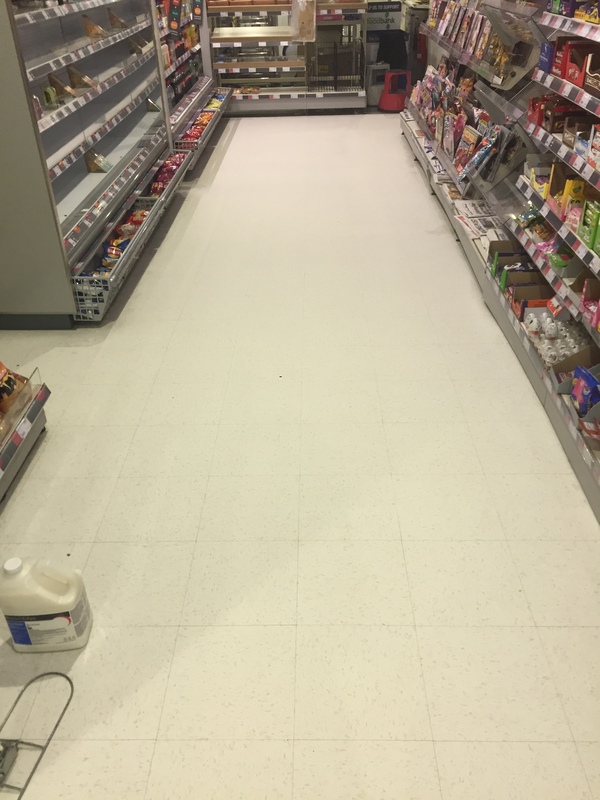 Once the flooring was clean and properly stripped the next step for us was to neutralise the surface prior to applying the sealant. 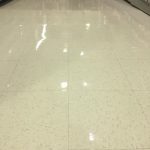 It is important to use an acid cleaner to bring the PH back to neutral as the product used to professionally strip the floor is an alkaline solution. 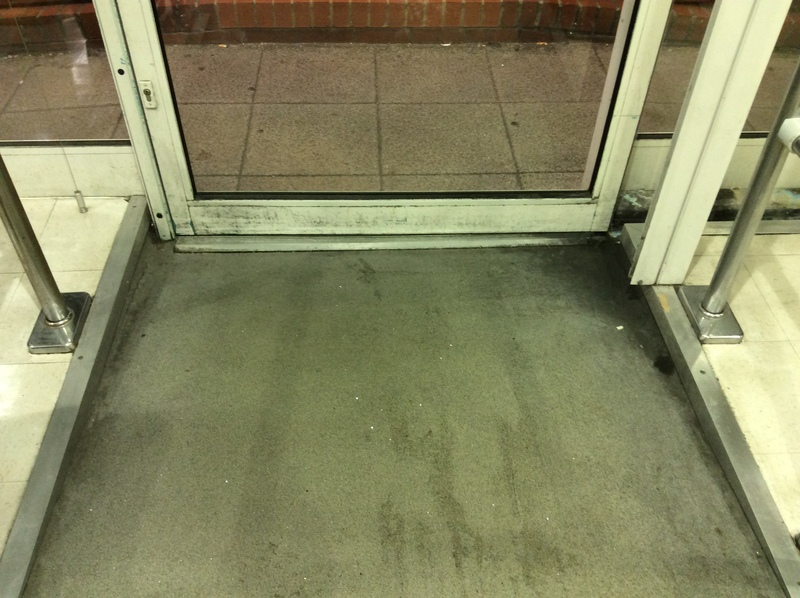 The sealant will react to any surface that is left as acidic or alkaline. 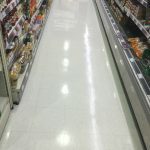 By understanding how different chemicals and surfaces react we are able to ensure the very best finish to your flooring. 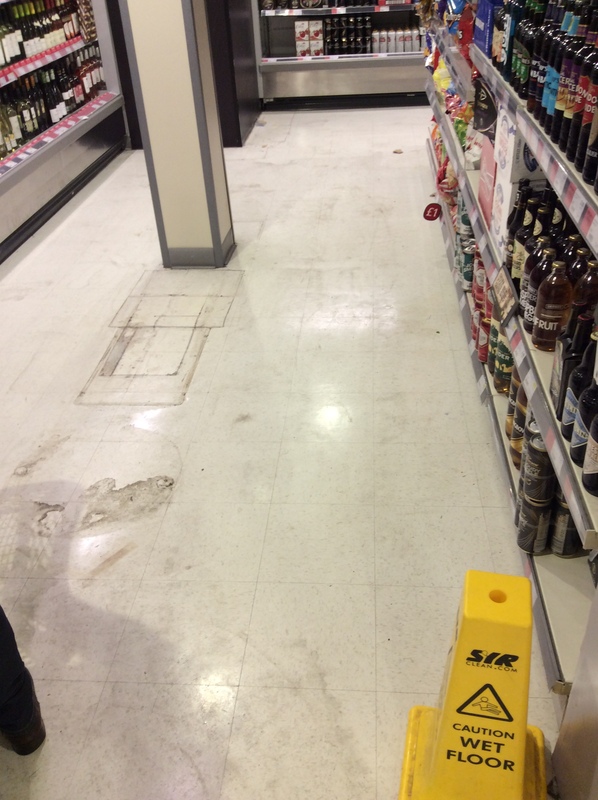 Once we have neutralised, we then undertake a final water clean to remove and prepare the surface further. 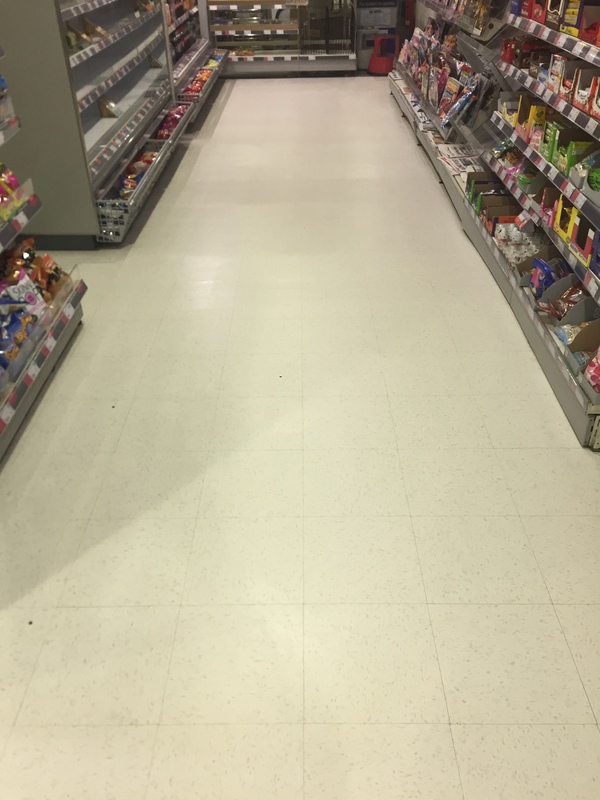 The client specified a self sealing matt polish finish. 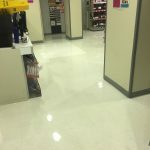 When initially applied this appears high gloss, but it dries to the matt polish finish you can see. 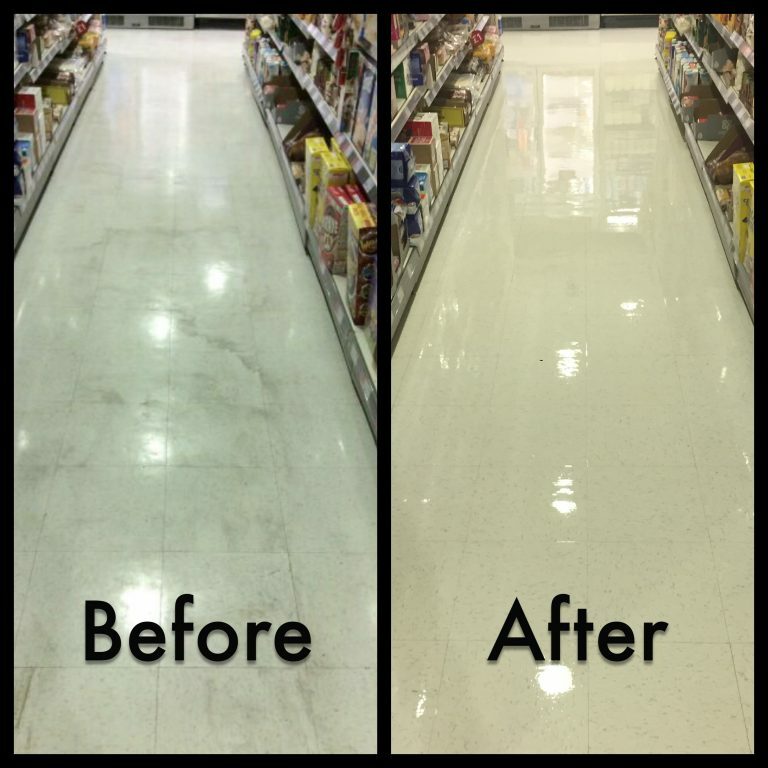 You can really see the difference our work made in the specific before and after shots of the same areas! 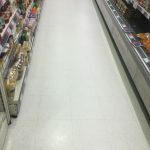 From the pictures above you can see that we have managed to strip all previous sealant and dirt from the vinyl tiling. 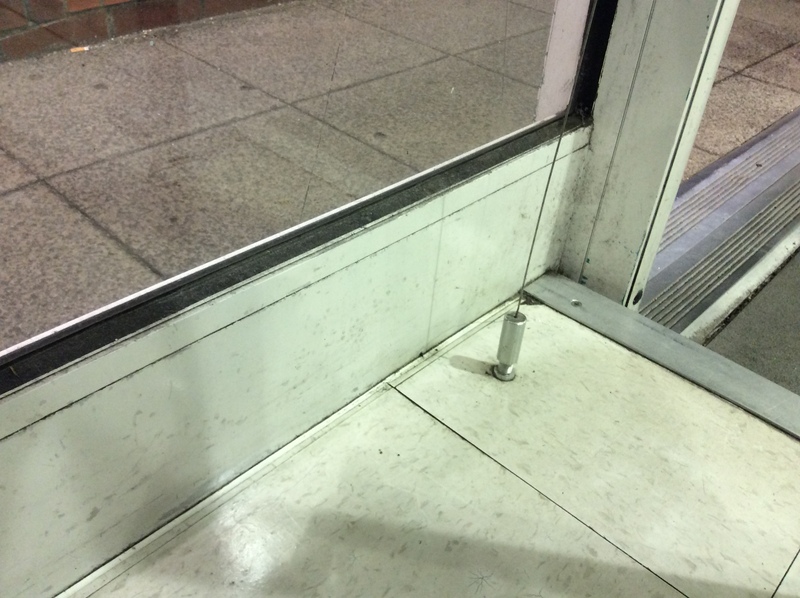 This leaves it ready to be sealed. 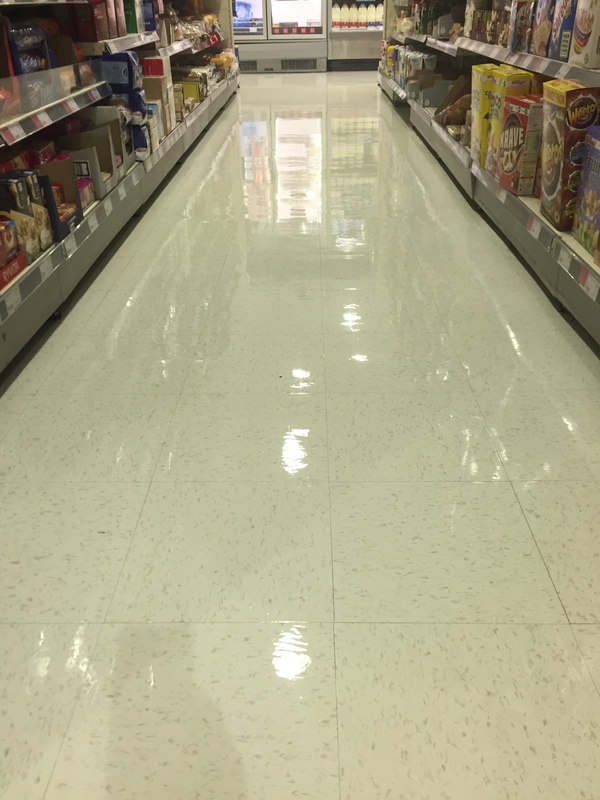 From the pictures above you can see that this particular sealant appears high gloss when wet. 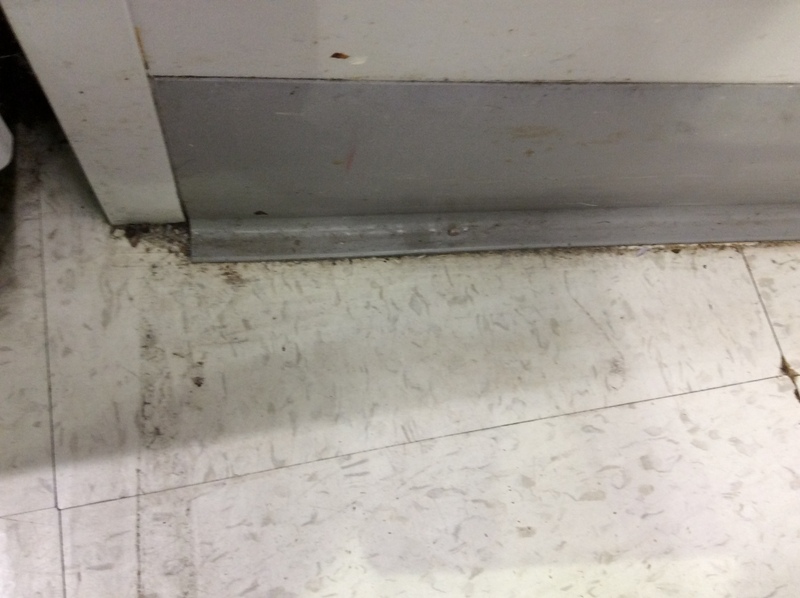 As this dries it takes on its matt finish.